Gudenzi Galleria is honored to announce the presentation of our first one man show of the internationally recognized American Artist Yun Gee from December 4th to 17th. Preview December 3rd, 2:00 to 10:00 p.m.
Mrs. Jehanne Bietry Salinger (mother of Pierre Salinger, Press Secretary of the White House) has written the preface for Yun Gee’s catalogue of the present exhibition and the exhibition includes her portrait as well as portraits of some of the art authorities of New York and Paris. 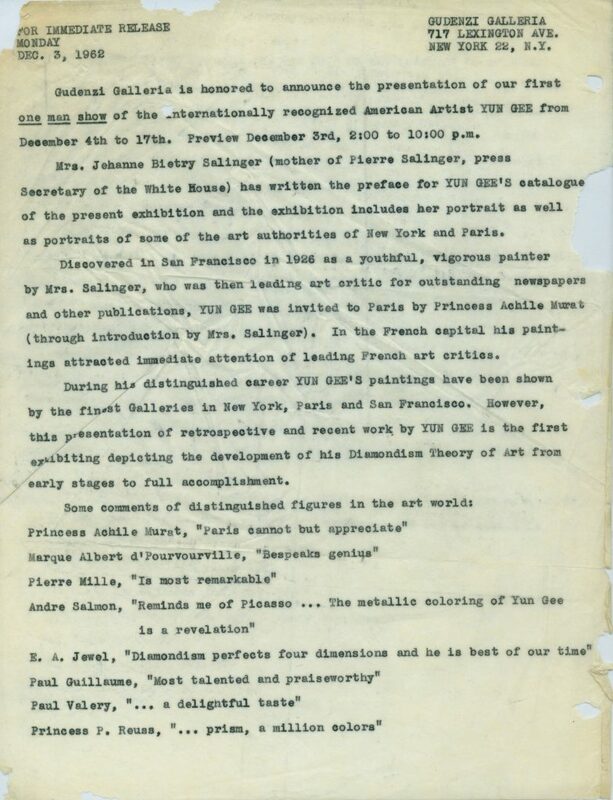 Discovered in San Francisco in 1926 as a youthful, vigorous painter by Mrs. Salinger, who was then leading art critic for outstanding newspapers and other publications, Yun Gee was invited to Paris by Princess Achille Murat (through introduction by Mrs. Salinger). In the French capital his paintings attracted immediate attention of leading French art critics. During his distinguished career Yun Gee’s paintings have been shown by the finest Galleries in New York, Paris and San Francisco. However, this presentation of retrospective and recent work by Yun Gee is the first exhibition depicting the development of his Diamodism Theory of Art from early stages to full accomplishment.